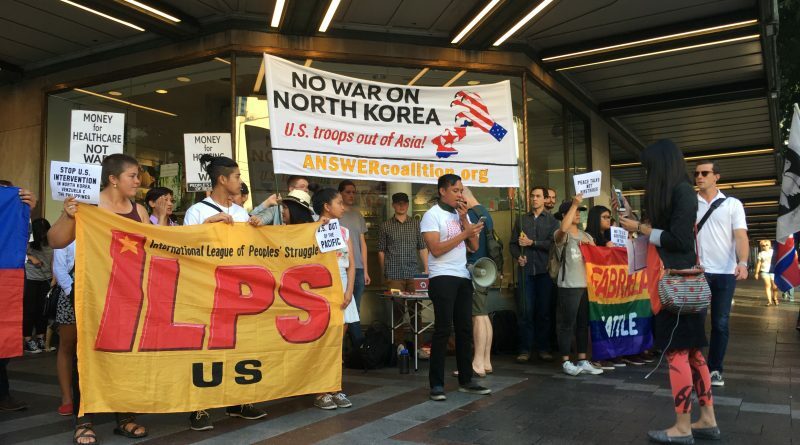 We, the International League of Peoples’ Struggle (ILPS), laud the efforts of the two Koreas to ease tensions that have resulted from Pres. Donald Trump’s bellicose statements and provocative military maneuvers by the US against the Democratic People’s Republic of Korea (DPRK). A high-level meeting was held last January 9th between the two sides to discuss various issues related to improving relations. This meeting was made possible after DPRK President Kim Jong-un in his New Year message wished success for the 2018 Winter Olympics in PyeongChang. At the meeting, which lasted 11 hours, the delegations from the divided country agreed on the participation of athletes from the DPRK in the Winter Olympics. They also discussed other issues related to improving relations such as the possible reunification of families separated by the Korean War. The parties also agreed to hold talks between army officials to discuss ways to avoid dangerous military incidents. It was the first official meeting by the two sides in more than two years. The negotiations took place in the Demilitarized Zone (DMZ) between the two Koreas. This breakthrough has led one analyst to say that the talks might yet be another example where when the US is sidelined and peaceful solutions can be found by local players. Time and again, the DPRK has made it clear that its nuclear program was only meant as a deterrent from possible nuclear attack from the United States, the only country in history that has used nuclear bombs against civilian populations. It is only reasonable for the DPRK to take the threat seriously and take measures in self-defense. The arbitrary designation of the demilitarized zone (DMZ) near the 38th parallel forced the separation of many Korean families. The reunification of families separated by the war remains one of the long-running issues between the two Koreas. It also forms the basis of the strong desire for the peaceful reunification of the country. But the US continues to serve as the main stumbling block. 30,000 US troops remain stationed in South Korea. The US conducts threatening air, sea and ground military exercises at its whim. We, the ILPS, stand for the eventual destruction of all nuclear weapons. But until then every country has the right to develop nuclear weapons to break the nuclear monopoly of imperialist powers and prevent them from using nuclear blackmail to bully other countries. We support the just aspirations of the Korean people for the peaceful reunification of their country. We demand the withdrawal of US troops and weapons from South Korea. Do you know why Lula is in prison? Trump Regime Considering Aggression against Venezuela?